We have been using sauerkraut a lot lately due to the healthy benefits it contains. I used to be one of those people who would pass on the sauerkraut too. 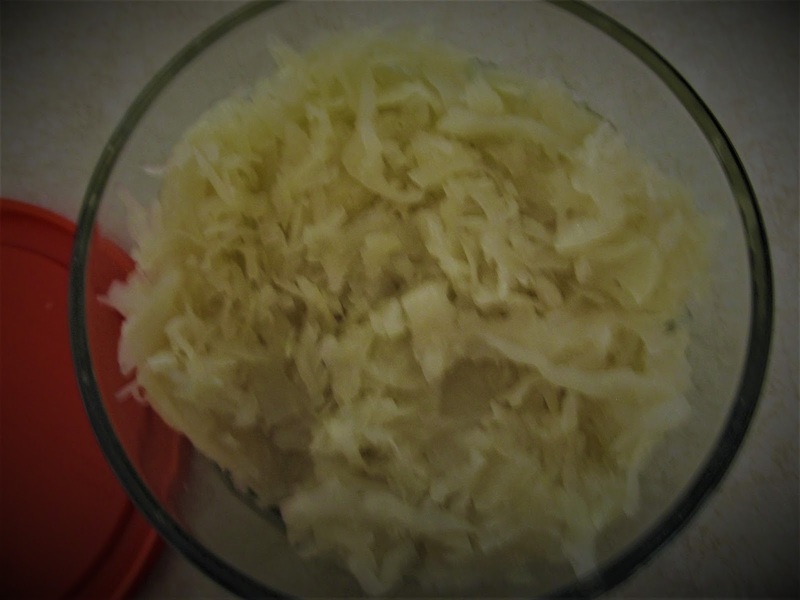 I now try and have sauerkraut as much as I can.. There’s only a couple of ingredients in sauerkraut which include 1 head of cabbage, garlic, non-idolized salt. Eating Sauerkraut can help move food through the bowels, eliminating bloating, cramping, gas and constipation. Sauerkraut contains fiber, vitamin c, vitamins k.
Eating to much of sauerkraut which is high in sodium can cause other health concerns. * If any of you are like me, I was told putting apple into the sauerkraut would add a little sweetness to it. I love sauerkraut ! My grandmother would always add some caraway seeds and a tablespoon of brown sugar to hers. Hi. Thank you for commenting and I will try the caraway seeds and brown sugar. Might take the bite out of sourness. I also want to wish you a Merry Christmas. Never considering using a slow cooker for sauerkraut dishes, but makes perfect sense… long slow cooking !! Thanks for sharing this idea! I am one who usually adds a chopped apple for a little sweetness to cut the tartness. Hi. I got that idea from you and Mark. Brings in a sweetness that I can tolerate.